For its Christmas 2002 release, Big Finish gift-wrapped a loving parody of Doctor Who. I hit the “Go home, Big Finish, you’re drunk” stage by the third cliffhanger. The Doctor and Mel stray too far towards the end of the universe, which in this particular iteration of Who canon is banal and boring. But not to worry! The diabolical Skelloids attack a generic planet, and only the Doctor and his beer-swilling redoubtable companion Sally-Anne can save them! Things get a little more frightening when an even more diabolical Alien Menace turns up and demands they go on a scavenger hunt to find fabulous artifacts. Because, you know, who needs a real plot when you can have IKEA robots and blob monsters. 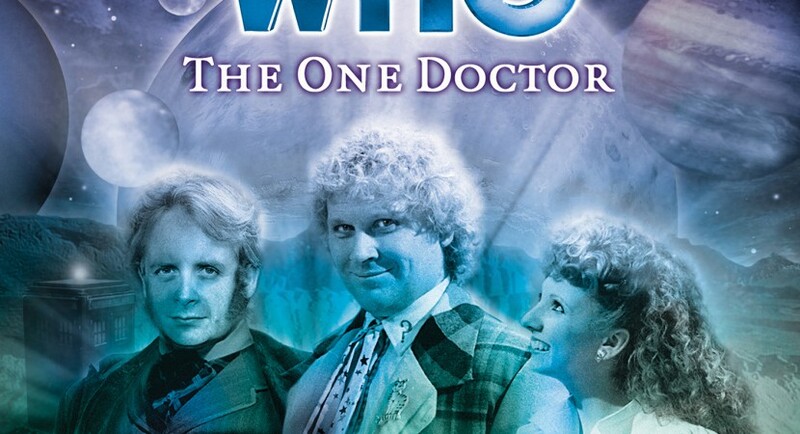 I can’t say too much, because it’s no fun watching Holy Grail if your friends have already spoiled all the jokes, but Colin Baker and Bonnie Langford have a merry time in this one, proving that Mel can be fun, too, when she’s given something to do. Also, a reminder that she’s a bright lass, one of the few who can parse the Doctor’s technobabble and even fly the TARDIS. Colin is in his element, sharing scenery-chewing duties with an over-the-top caricature of a Doctor who carries his annoying role with panache. Ditto for Sally-Anne, whom I can’t help visualising as Sherma from Carnival of Monsters. Their nerdy SciFi endearments like “my little coelacanth” were so bad they were beautiful. Just enjoy the ride. There’s one vomit-inducing “feel good story” that probably puts off all the Mel-haters who were starting to warm up to her, but this playful audio is a welcome palate cleanser if you need a break from Big Finish angst and dystopias. Here’s some better custom cover art by Simon Hodges. Stating the obvious, but it’s a fine irony that the one thing The Doctor Would Never Do back in 2002 has happened many times in the new series (or, to be fair, in the Eighth Doctor adventures). Forget Stone Angels; the Shelves of Infinity are one of the most diabological concepts the Whoniverse has ever invented. I lost it when the infamous Delaware Theme kicked in. Delia Derbyshire is probably spinning in her grave, but I’m amused that it finally escaped from wherever she buried it. Production Code 7C/R simply jams it somewhere after Trial of a Timelord and before Time and the Rani, which doesn’t tell us much. It’s the first Mel and Sixth Doctor audio, which means it has to be late in his run, after he’s said goodbye to Evelyn, Flip, Charley, Constance, etc. He and Mel are comfortable with each other, so they’ve been together for a little while at this point. The next story after it in the Doctor & Mel’s timeline is probably The Juggernauts.